Purchasing a llama is a big investment! Be sure to get the llama that's right for you. 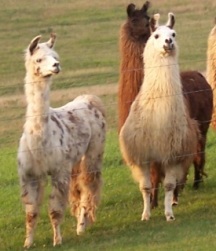 Here are some ideas for new llama buyers to consider. Be Informed. Do your homework before you start shopping! No doubt about it, being well-informed is essential when shopping for a llama. There are many ways to secure the information you need. 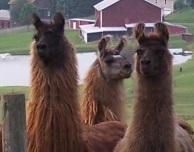 Visit llama-related websites, read llama-related publications, and contact local and/or national llama organizations; all of the preceding offer tons of important llama information that will make you a better consumer capable of making a better decision. If there are any llama events in your area (such as shows, exhibitions, conferences, etc. ), attend by all means! If you've never gotten "up close and personal" with a llama before, this is an important step. One of the best ways to find out about llamas and llama ownership is to pay a visit to a working llama farm, like Leisure Acres Llamas. We welcome visitors and are always happy to help provide the information they need to become respinsible, happy llama owners. If you'd like to pay us a visit, just give us a call or CLICK HERE for our quick and simple Visit The Llamas form - we'll set aside a time just for you, so you can get the facts you need and ask as many questions as you like. While you're visiting the llamas, don't forget to check out the llama essentials like barns, fencing, chutes, fans, feed storage, etc. And ask questions! It's the best way to learn. Decide what you want your llama to do, and look for one that meets your needs. Do you want a trek animal, a herdsire, or a family pet? 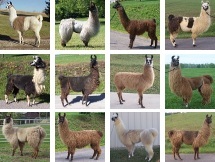 There are many types of llamas, each with different characteristics, and whether or not you're happy with your llama depends a great deal on whether you've purchased one with the characteristics you want. Being clear about what you expect from your llamas will help you decide on how many to buy, what age llamas are best for you, whether showing experience and training are important, and much, much more. If you're planning to breed your llamas, pedigree is important; count on helpful experts like the people at Leisure Acres Llamas to help you learn to research and evaluate a pedigree. But the first step is definitely yours: you must know what you want from your llamas in order to buy llamas that will make you happy. Shop with your eyes wide open! Sometimes the biggest challenge to buying the right llama is the llama itself - they tend to have such intriguiging personalities and endearing, offbeat good looks that it's easy to overlook common physical problems. 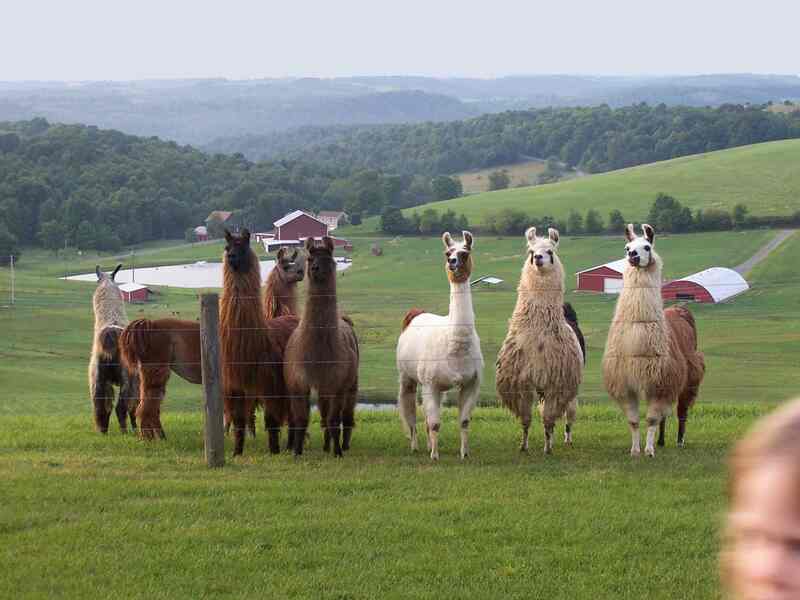 Llamas are discussed in terms of "conformation" to a standard; in other words, they are judged by how closely they conform to the ideal. While there is no such thing as a "perfect" llama (any more than there is a "perfect" person!) the standards provide a valuable set of benchmarks. Being familiar with the standards is important; doing your homework before you start shopping will arm you with the facts you need. Observing the llama in motion is crucial. 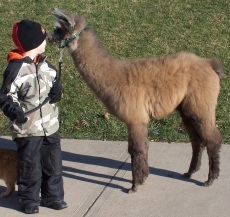 Ask the owner to walk the llama toward you and away from you; watch the animal's gait and placement of the feet and note if there is any obvious discomfort or tentativeness. If you're not comfortable with the idea of perfoming a thorough examination (which should include picking up the feet and looking at the pads and toenails, as well as checking the bite, the vulvar conformation, the testicles, the body condition, wool quality, etc.) ask another breeder or a veterinarian for assistance. Conformity is not as important for a pet or guard animal as it is for llamas destined for breeding or showing, but a thorough exam is an important part of the purchasing process. Don't be shy about asking the breeder questions! And don't hesitate to request health and reproductive records. If relocating the llama to your land involves a journey of any distance, find out if the llama has ever travelled. If not, an experienced travelling companion should make the move with them, or they should be trained to trailer before the move takes place.